Hop on board as we continue our journey Around the World in 80 Models! We began our itinerary at Sketchfab headquarters in New York and are working our way through Europe, Africa, Asia, Oceania, South America, and North America. To catch up on past destinations, check out the rest of the Around the World in 80 Models series. This week we’re in Jerusalem, where archaeologist Jochen Reinhard takes us from the Iron Age to the Byzantine period by way of a section of the city’s walls. Hi, my name is Jochen Reinhard. Originally from Hamburg, Germany, I’m now based in Central Switzerland. In my day job I’m an archaeologist at the Archaeological Department of the Canton of Zug, responsible mainly for excavation and survey work. In my free time (that’s mostly at night) I – like many archaeologists – tend to occupy myself with more archaeology. Amongst other things I try to integrate geeky hacker maker high tech low-budget stuff into my archaeological work in what I call ‘archaeobotics’ – aerial photography with poles, kites and multicopter or fixed wing drones, diving robots, fishfinder sonar, 3D modeling, 3D printing – you name it. 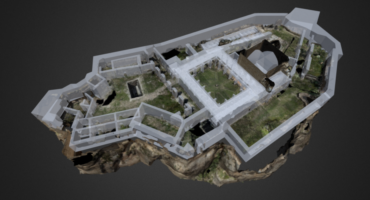 The 3D model featured here shows the situation on the last day of the 2015 campaign of the Mount Zion Cemetery excavation in Jerusalem, Israel, after weeks of clearing vegetation, dusty digging and shifting thousands of buckets of dirt. 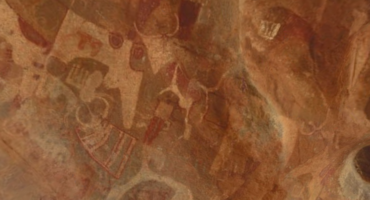 The excavation works are led by Prof. Dieter Vieweger and Katharina Palmberger M.A. from the GPIA in Jerusalem. The site is located south of today’s Old City, near Dormition Abbey on Mount Zion. Despite the name, not a cemetery, but the walls of the Iron Age to Byzantine City of Jerusalem have been unearthed (again). Me, myself and survey equipment (photo: Katharina Palmberger). Clearing the excavation area – in a cloud of dust (photo: GPIA). Archaeological still life (photo: Katharina Palmberger). …and after the excavation campaign (photo: Katharina Palmberger). True Orthophoto derived from the 3D model and overlaid with survey data (drawing: Jochen Reinhard). Coloured Digital Elevation Model overlaid with survey data and contour lines (drawing: Jochen Reinhard). 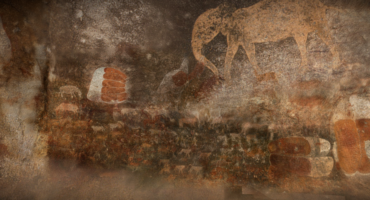 The model itself was computed by Structure from Motion Photogrammetry with Agisoft PhotoScan Pro – my preferred method of 3D recording for archaeological purposes as computers, cameras and surveying equipment are readily at hand on every excavation whereas laser scanners normally are not. Katharina Palmberger, who took the photos, used a Canon EOS 700D (Rebel T5i) with a Sigma zoom lens. A few additional overhead shots were taken with a Sony Cyber-shot DSC-HX400V mounted on a pole (a level staff, to be precise) with help from Marcel Serr. The model was primarily meant as a means of creating mapping data to complement the survey measurements, like orthophotos, a digital elevation model and contour lines. Despite the non-ideal lighting conditions of the late Near Eastern summer with its glaring sun and hard shadows, the model turned out much better than expected – it fits the survey measurements just fine. And being able to put it on Sketchfab, too, to create a “guided tour” of the site is a huge plus! To see more of Jochen’s models here on Sketchfab, check out his profile! Abby and Néstor are Sketchfab Masters. Abby Crawford, Ph.D. is trained in and passionate about Roman Archaeology and works as a freelance artifact illustrator and 3D scanner in California. Néstor F. Marqués is a virtual Heritage & cultural diffusion researcher, and an enthusiast of ancient Rome’s culture. Around the World in 80 models is a project by Abby Crawford and Néstor F. Marqués that combines the beauty of archaeology, travel, and virtual reality here on Sketchfab. Each week will a feature different landmarks scanned by collaborating professionals in a different area in the world. In the Cultural Heritage page, we invite our 450+ museums and cultural institutions to talk about their use of 3D and VR to promote their collections. Sketchfab supports these institutions with free Business accounts. Please visit sketchfab.com/museums for more information.